Ginny does seem to be feeling pretty good (which I'm very happy about). To look at her, you wouldn't know what was going on inside. Mum, the impression I got from the doctor is that he was going to do some research and figure out what we need to do next. He didn't prescribe anything besides the Baytril. I may have heard this incorrectly, but I think he mentioned something about an abormally functioning liver affecting the pancreas in dogs and cats? It was something else he wanted to look into. It may well be. Just so long as he knows that diabetes is apparently quite common, and treatable, in guinea pigs (you may need to let him know that). Ginny has been doing well! In February, I followed a GL link ( http://www.guinealynx.info/links.html#diabetes ) and read about dietary changes for diabetic pigs. Happily, Ginny was not on a terrible diet to start with, but I stopped feeding her fruit, decreased the greens, and absolutely no carrots. I started really pushing the hay. During this time, she stopped eating twice. Once was my fault; I fed her an inch-sized cube of apple. I'm not sure what the cause was for the second, but started handfeeding her immediately both times. Ginny was not impressed with my Critical Care recipes. Her weight actually reached 1193g (2 lbs, 10 oz) last week, but usually she hovers in the 1160g - 1180g range. There have been no dramatic weight losses since February. I still weigh her daily. The cataract in her left eye has remained the same, according to my visual inspections. She still has some vision in that eye. I still cannot see a cataract in her right eye, although the vet said there was one. She is lively and friendly, and enjoys her meal and floor times. She is not on any medications at this time. I'd like to take her back to the vet in the fall, and see if her bloodwork has improved. Great update! Thanks for keeping us posted! Oh, that's such good news tracis! Great big Yay to Ginny! Ginny's "rooster tail" has grown back. She shed it over a year ago, during a visit to the vet. I never expected to see it again, after it didn't grow back right away. I hope this is a sign of continued good health. Her feet are multi-colored, so her toenails always tend to look long. Ginny always looks so lovely Tracis. I hope Ginny continues to be healthy. She really is a very pretty girl. Aw, Ginny is adorable. Glad she's doing well. Oh cool! I bet it is indeed a sign of improved and 'normalized' health. Ginny's health was good these past years, and she was very feisty and happy. We celebrated our 4th anniversary with her last weekend. Both girls had a visit with the vet yesterday. 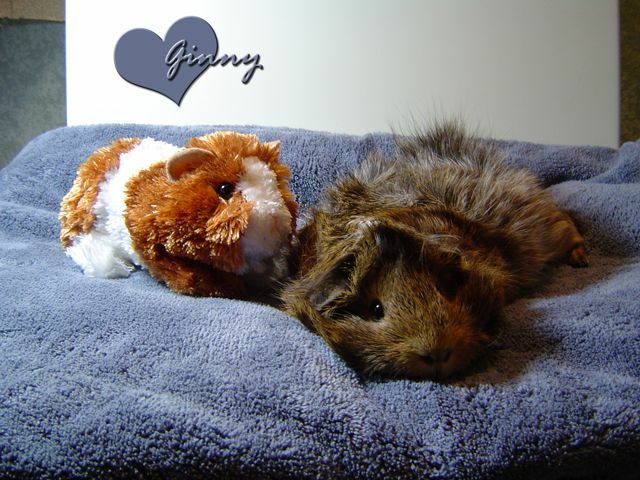 During the exam, the veterinarian discovered that Ginny had a heart murmur. She was very lightly sedated for x-rays to examine the size of her heart and to perform a blood test. She did not recover well from the sedation and died on the way home. She was just past four years old. X-rays showed an enlarged heart and a large growth in her abdomen that was most likely an ovarian cyst. Her liver did not appear to be enlarged, and the vet mentioned that it had repaired itself since the original fatty liver diagnosis (hepatic lipidosis). Her abdomen was full of fluid, and there was also fluid around the heart and lung area. The vet had planned to start her on heart medications. She had a blood test prior to her death. Her glucose level was 198 (previously 519). Although a necropsy was not performed, it does not appear that her death was related to diabetes. I'm very sorry, Tracis. Godspeed and safe passage to a beautiful pig and a very special spirit. Oh, Tracis, I am so terribly sorry you lost her. 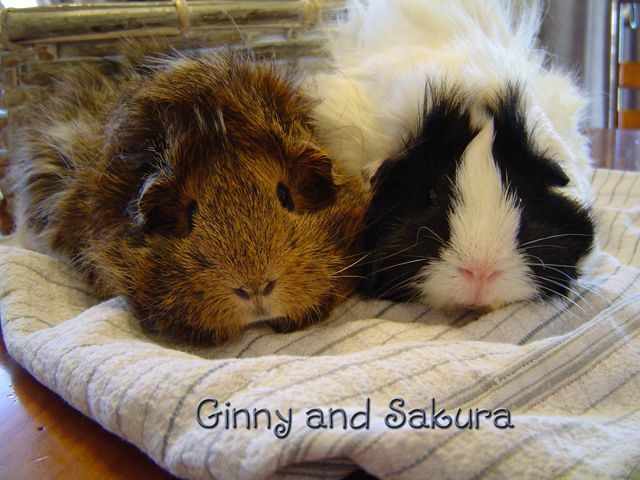 I know how you treasure your guinea pigs, the luxurious lives they lead and how much you love them. I am so very sorry she is gone. Tracis, I am so sorry to hear about Ginny. How is Sakura doing? Sleep well, Ginny darling. What a beautiful girl you were. I'm so sorry for your loss. She was a beauty. I am so sorry you lost Ginny. I'm so very sorry. She was such a gorgeous girl and so loved. Hugs to you. I'm so sorry. She was a beauty.